As I have stated previously, my Mom and I have to make 4 different cut out cookies, every year. One for different members of our spoiled family! We spend half of the month of December baking and decorating cookies. Of course, they are stashed in the freezer and my boys are threatened with the wrath of Binky, if they dare to sneak any. Jam Filled Cookies! So this is the last one I have to post here on BCC, besides the fun, easy ones I do! By themselves, none of them would be considered difficult, but this is the nicest dough to work with! It is foolproof! It has no leavening, so it is more like a shortbread cookie than the rest of the cookies we make. The powdered sugar glaze on the top and the currant jam make for a lovely presentation. I have to say, that all of the Holiday cookie platters, that I have seen, are not quite as pretty as ours! You, of course, can have lovely cookie platters, as well, since I divulge all of my secrets here! The original recipe for these cookies comes from a cookbook that my German Grandmother had. It was published in 1962 and she sent one to my Mom for a gift. When she passed away, I got her copy of the book. It is Koch- und Haushaltungsbuch (Literally translated Cook and Housekeeping book, but more appropriately it would be entertaining. Not housekeeping) and one of the authors was M. Künzler. This being my maiden name, we always refer to it as the “Künzler Cookbook”. Although my Dad does not believe she was any relation. I have had a request for a link to the cookie cutters that I use. Our original cutters broke long ago, so I replaced them with this cheap Linzer Cookie set. When I was looking, I found this one though! I love this one because it has a lot of different inserts that are fun. Snowman, Angel, a bunch of cute ones. If you want an easy Cut out cookie that is gorgeous on your cookie platter, this cookie is for you! 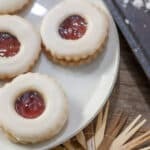 Give Hilda brötchen a try! You won’t be sorry! I hope you like the recipe today for Hilda brötchen! These Hilda brötchen will liven up your holiday cookie platters! They are so festive! Cream butter in mixing bowl until light and fluffy. Add sugar and cream again, until light and fluffy. Add flour in three parts. Mix just until well combined. Don't over- mix. If you have a messbecher, it is easy to measure the ingredients in weight. You can find them at specialty stores and online. Wrap dough in waxed paper, then in plastic wrap. Refrigerate at least a few hours, or overnight. Roll out dough between 2 sheets of waxed paper. Cut pieces for bottoms. Then put a hole in the center of of the tops. Bake at 325°F for about 25-30 minutes. Mix powdered sugar and water to form a smooth, fairly thick, glaze. The easiest way that I have found to glaze the tops, is just to dunk them upside down, in the glaze. Flip them over and let them dry for about 15 minutes. Don't let them dry for a long time, because the icing will get too hard to clean up. While they dry, place the jam on the bottom cookies. Carefully pick the cookie up from the edges. Using a knife or toothpicks, scrape the excess off of the edges. Place the cleaned off top on top of the jam. Done!! Can be frozen in containers with waxed paper between the layers. They only freeze for about 2 weeks before the glaze gets freezer burned. I have been waiting for this recipe! They are so cute and sound absolutely delicious! And how fun is it to say the name, lol! Thanks so much Amy! I told you I would have them up in a week, or so! Yes, they are too good not to eat, though! Thanks so much Lisa! I think I need to bring out the wrath of Binky because my family ATE ALL MY HOLIDAY COOKIES! These look gorgeous. Oh, no!! Tell them you are on strike and not making one more cookie!! Thanks for the comment, Lisa! WHOA! I always thought these were an Italian cookie! I had no idea it was of German heritage. They’re definitely beautiful cookies for a cookie tray. I think the Italians have their own version, as well! Thank you for your comment, Alyssa! Yum. A nice simple recipe that will be a great base for a cookie recipe. I will have to use this recipe soon. Thank you Luci! The dough really is unique and quite delicious! My mother left me the same cook book (1956 edition). Your recipes are so helpful because I don’t have to convert kilograms into cups. If you have a link to Hildabrotchen cookie cutters, I would love to have it because mine are almost 50 years old. Thank you. Hi Evelyn! I added 2 links to the post from Amazon. One is bigger than the other, but it has some cute shapes for the insert! The conversion is a pain at times. Particularly if you are doubling the recipe! Thanks for your comment! I’m not seeing bake temp or time per batch? Hi Diana! I’m so sorry! It is 325°F for about 25-30 minutes! Thanks for stopping by! Merry Christmas! Thanks for sharing Hildabrötchen, Inka! !